Finally a complete suite of Windows XP Desktop enhancement, XP Visual Tools is loaded with all you need to tweak your Windows XP Desktop. Now you can do anything you want, from changing transparency level of XP Start Menu and XP Taskbar to easy swapping between different Windows XP LogonUI or Windows XP Wallpapers and applying Windows XP Skins (XP Themes) to old programs. 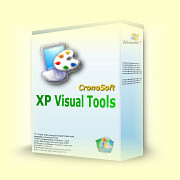 XP VISUAL TOOLS remains user friendly and easy to use even if it�s so powerful!